This dining arm chair with swivel and rocker base adds seating to your outdoor dining room where you can entertain guests or a delicious meal with friends or family. The chair back features a geometric design while the padded cushion adds comfort to this chair. The swivel rocker base creates the ability to gently move and rock for a more comfortable sit. The Belmeade Swivel Rocker Dining Chair with Geometric Chair Back Design by Lane Venture at Design Interiors in the Tampa, St. Petersburg, Clearwater, Florida area. Product availability may vary. Contact us for the most current availability on this product. Finish & Paint Options Available only in finish shown. Construction Powder-coated aluminum frame with sturdy synthetic wicker with UV inhibitors to minimize sun effects. Fabric Options With our many fabric options, updated yearly, you are sure to find one that matches your style. Cushion Multiple layers of premium quality thermally bonded fiber creates core of drain-through cushion. Warranty 5 Year Limited Warranty, see store for details. Create an outdoor dining room where you love to spend time with friends and family with the Belmeade collection. Gather chairs around a large table to enjoy delicious food and drinks while enjoying fresh air. Choose a chair with rocker and swivel base to have gentle, relaxing movement. This collection shows off a bright white finish and contemporary geometric pattern on table tops and chair backs. 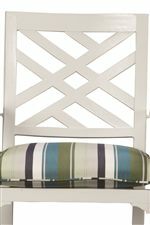 The Belmeade collection is a great option if you are looking for Tropical Coastal Outdoor Furniture in the Tampa, St. Petersburg, Clearwater, Florida area. Browse other items in the Belmeade collection from Design Interiors in the Tampa, St. Petersburg, Clearwater, Florida area.